This article is about the city in Morocco. For other uses, see Mohammedia (disambiguation). 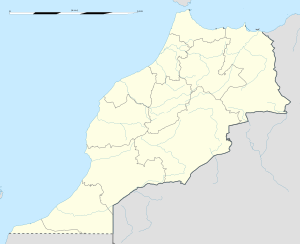 Mohammedia (Arabic: المحمدية‎, Berber: Fḍala) is a port city on the west coast of Morocco between Casablanca and Rabat in the region of Casablanca-Settat. It hosts the most important oil refinery of Morocco, the Samir refinery, which makes it the center of the Moroccan petroleum industry. It has a population of 208,612 according to the 2014 Moroccan census. The harbour, at what is now Mohammédia, was originally named Fédala (فضالة). This name comes from the Arabic words Fadl Allah (فضل الله) which means "favor of God". Traces still exist of its business role under the Almoravid dynasty. It was frequented in the 14th and 15th centuries by merchant ships from Europe seeking cereals and dried fruits. In 1773, the Sultan Sidi Mohammed ben Abdallah made of Fédala a grains warehouse of Tamasna province and built the Kasbah to protect the shops for traders. He built the white masjid Al Atik as well. During the precolonial period, competition between the Western powers to ensure the economical exploitation of Africa was behind the merger of Europeans interests in the ports of Morocco. In the region of Fédala, the German family Mannesmann acquired a large area of land. The Treaty of November 4, 1911 between France and Germany on the partition of Africa forced the Mannesmann family to abandon the lands they held for Georges and Jacques Hersent, two French industrialists, who noticed the existence of a natural bay, valuable for the creation of a large port at low cost. The group Hersent created the Franco-Moroccan company in 1912 and founded the port company in 1914 that took a leading part in the development of Fédala. The rapid growth of the city started around the port, which allowed the development of various industries such as canning fishery products, agro-industry plants, tannery, textile, etc.. The seaside town took shape in 1925 and the Esplanade was built in 1938. The construction of the sea line in 1951 made of Fédala the first and most modern oil port in North Africa. US Army invaded Fedala from the Atlantic on November 8, 1942 as part of operation Torch. The invasion was carried out by the Center Attack Group of the Western Task Force which landed on the Atlantic coast of Morocco. The landing began on 4 AM. Fedala was renamed Mohammedia on 25 June 1960 in honor of King Mohammed V, the restorer of Moroccan independence, on the occasion of laying the foundation stone of the Samir oil refinery. The new name indicates the modern character of this city. [clarification needed] Today, the city serves as both a seaside resort and a manufacturing center. Mohammedia is also a resort city containing a golf and tennis club, casino and many other activities. In addition, people call it madinate lwouroude wa riyada which means "city of flowers and sports". Within the past decade, Mohammedia's beaches "Sablet & Mimosa" have drawn many people from Casablanca, and its nearby cities. Sablet and Mimosa have been under development, building new beach condos, villas, as well as more investments in small businesses which creates more jobs. Summer is simply the best season in Mohammedia being that there is more involvement due to an increase of the population. There is a wide range of outdoor activities including basketball, soccer, surfing, and fishing. The night life is a great experience to be part of, including several cafes, restaurants, clubs, and a boardwalk. A couple of beach residential areas that are good place for vacation are "Residence of Oubaha" and "Palm Beach." There are several other projects going on in the city of Mohammedia as well as infrastructure throughout the city. Mohammédia lies along the Atlantic Ocean 24 kilometres (15 miles) northeast of Casablanca. It is located between the outlets of the rivers Oued El-Maleh and Oued Nfifikh and is bordered by the Atlantic Ocean to the north, Ben Slimane Province to the east and south, and the prefecture of Sidi Bernoussi-Zenata to the west. Mohammédia has a hot-summer Mediterranean climate (Köppen climate classification Csa). The moderating effect of the Atlantic Ocean influences strongly on the city climate and makes its winter soft and warm, and its summer hot and cool. Mohammédia enjoys plenty of sunshine throughout the year with measurable precipitation annually. The period of November through April is mild and rainy with average high temperatures of 17 to 21 °C (63 to 70 °F) and lows of 8 to 12 °C (46 to 53 °F), however temperatures can occasionally drop to around 2 °C (36 °F) in the morning, or be as high as 24 °C (75 °F) for a few days during winter. The period of May through October is warm to hot and dry with average high temperatures of 22 to 26 °C (72 to 79 °F) and lows of 15 to 20 °C (59 to 68 °F), but temperatures can exceed 32 °C (90 °F) and occasionally reach 40 °C (104 °F). Most rainfall occurs from November to April, and the average annual precipitation is around 432 mm. Precipitation is most commonly in the form of light rain showers, but sometimes there is heavy rainfall and thunderstorms. Bni Yakhlef 371.03.01. Rural commune 5975 29723 10 29713 11490 residents live in the center, called Ben Yakhlef; 18233 residents live in rural areas. 1994, 2004 : official census; 2010 : calcul. The city has a French international school, Groupe Scolaire Claude Monet, serving moyenne section through collège (junior high school). Mohammedia, whose size has increased significantly during the second half of the 20th century, is becoming one of the biggest cities in Morocco. New neighborhoods are built in all the parts of the city and more people live in town. The city is divided into 3 major distinct areas, the Kasbah area, the Al-Alia district, and the eastern coast. This district is located southern in the city on a gentle hill slope, which gives it the name Al-Alia that means the upper side. It was built in 1948 as a solution to the shantytowns problem, where rural population were living, attracted by the industrial development of the city and looking for a job. Today, the district equals a small city in continuous expansion, equipped by all necessary facilities. Ancient subdivisions: El Hassania, Derb Marrakech, Diour Doukkala, Derb Jamila, Derb Ourida, Derb Fath, Derb Douchmane, Riyad Salam, Derb Laâyoune, Hay Al-Houria. New subdivisions : Hay El-Falah, Anfa, Rachidia, Hay Reda, Hay Nasr, Hay el-Fajr, La Colline, Hay Al-Wahda. Infrastructures and mobility: The Municipal Theater, the Coach Station. The east side of the city is famous for its beaches, where the inhabitants of Mohammedia, Casablanca and the surrounding towns go swimming. Almost all of the area is a villa zone. However, many buildings have spring up on the seafront over the last 10 years, including an increasing number of luxury apartments. Most of the faculties of Mohammedia are located in this side of town as well as a Marjane Hypermarket and a McDonald's restaurant. Beaches: Santa Monica, Les sablettes, Mannesman, La Siesta. Subdivisions: Soleil, Nice, Yasmina, Al-Asil. Abraham Serfaty, Moroccan political activist. Ahmed Faras, former Moroccan football player. Noureddine Ziyati, Moroccan football player. Tarik El Jarmouni, Moroccan football goalkeeper. Reda El Amrani, Moroccan tennis player. ^ a b "POPULATION LÉGALE DES RÉGIONS, PROVINCES, PRÉFECTURES, MUNICIPALITÉS, ARRONDISSEMENTS ET COMMUNES DU ROYAUME D'APRÈS LES RÉSULTATS DU RGPH 2014" (in Arabic and French). High Commission for Planning, Morocco. 8 April 2015. Retrieved 3 June 2016. ^ "Histoire de la paroisse". Website of the Church of Saint Jacques. 2012. Retrieved 2013-10-05. ^ "Groupe scolaire Claude-Monet." AEFE. Retrieved on June 16, 2016.